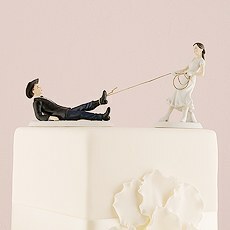 Whoever your favorite sport team, you two are the main players. 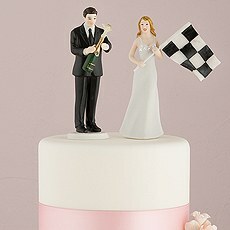 Are you and your spouse-to-be major sports fans? 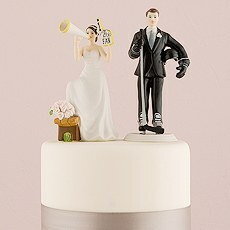 If so, Weddingstar has the perfect collection of unique cake toppers for adding a special touch to your reception. 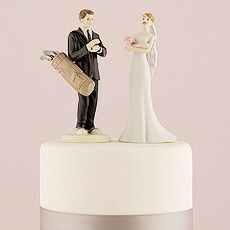 These sports wedding cake toppers feature a wide variety of athletic events, allowing you two to showcase your sports pride in a distinctive way. 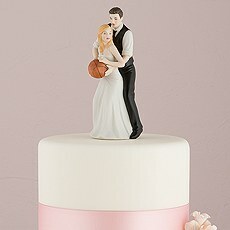 Whether you two are former athletes yourselves or huge fans of a college or pro team, you'll be able to add a personal touch to your reception when you use this fun and fabulous wedding cake decor. 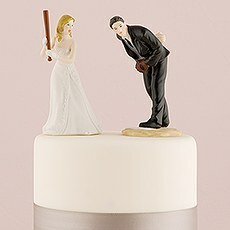 Your guests are sure to remark on this memorable and charming display of your love for each other as well as your love of the game.Browse our full collection of wedding cake toppers for sports fans to find the one that matches your athletic interests. 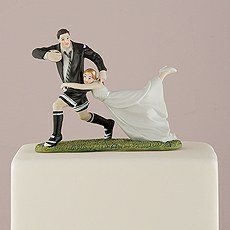 If you're huge fans of football, soccer or rugby, you'll love that these delicate figurines feature the bride and groom partaking in their favorite sport together. 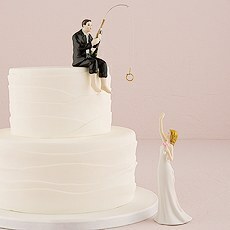 There are also some humorous takes on popular activities, like a bride capturing her groom with a lasso or catching her groom on the end of a fishing line. 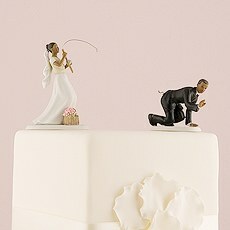 These fun takes on popular athletic activities allow you to express not only your love for a certain sport, but also you and your spouse-to-be's unique personalities. 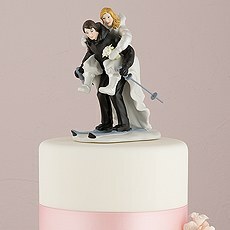 Plus, you can customize many of these designs to look more like you do in real life. 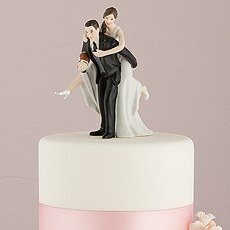 Just select the hair color and, in some cases, the skin tone to create a completely personalized look for your wedding cake decor.If you love the idea of personalized cake toppers, be sure to check out our complete collection of customizable wedding decor at Weddingstar. From customized napkins to themed guest favors, there are plenty of ways to add a personal touch to some of the most important wedding accessories for your event.